So what are your views on rodeos? Where does it fall, for example, on that entertainment spectrum between bull-fighting and shows where animals do tricks? Through the legal lens, there’s currently a two-part test to determine if the law protecting animals has been broken. First, has the animal experienced pain or distress? If not, then no further enquiry is warranted. But if it’s considered that the animal has indeed experienced pain or distress, then the second part of the legal test is whether or not the pain or distress was “reasonable” or “necessary”. So, is the use of animals for entertainment purposes reasonable or necessary? The links below set out contrasting views, but importantly remember that law theoretically reflects the majority of public opinion. 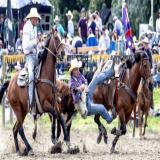 The articles in the links immediately below would suggest that while "many" kiwis support a ban of rodeo events (“Survey shows many Kiwis support rodeo ban”), the "many" is still not a "majority" because the activity is still lawful ("Government says 'no' to calls for rodeo bans”). Are the changes referred to by politicians "enough", or being implemented in a timely manner? Any credible decision making by a politician would involve veterinarians, right? - because veterinarians are widely trusted by society as “the animal health and welfare professionals”. On that basis, it's worth a moment to have a look at the New Zealand Veterinary Association’s position statement on the subject of rodeos. And here’s another point for consideration. If there were really enough of the public collectively telling the politicians that New Zealand's current society expected people in charge of"sentient" animals to be responsible for the animal’s positive experiences (e.g. pleasure, comfort, interest) rather than simply setting the bar at what levels of pain or distress can be justified as “reasonable” or “necessary”, then what would be the future of rodeos? – or, for that matter, other areas of entertainment involving animals? Would a complete ban be warranted, or is there a halfway house where certain events might be removed or modified to ensure protection and pleasure for the animals, as well as the people?